There is a lot of dog humor out there. Does your dog make you laugh? Does he ever do something that is just too funny and you wish you captured it on video or in a photo? 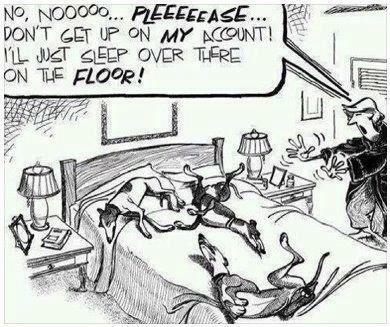 Anyone with "multiple pet syndrome" will be able to relate to this cartoon! 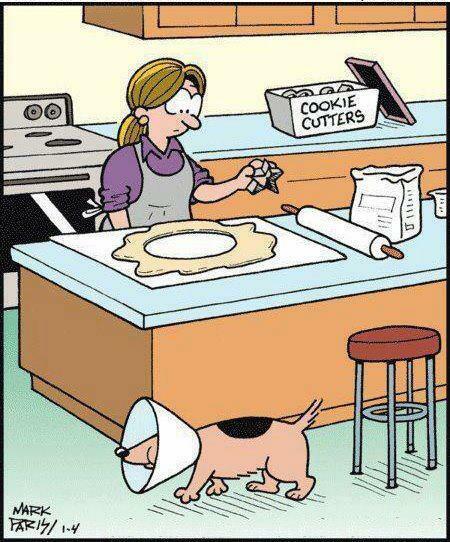 This image has been shared around and is a good one to use to generate laughs among pet owner clients and customers. For example, if you are selling beds and mattresses, you can point out the need for a king size bed in homes that have pets because everyone will want to sleep there at the same time. Dog owners may have experienced the same situation with their own pets. They love to see that someone else has done it as well, so they will share these photos among themselves. Here's a little marketing tip for anyone who has a pet business. Create emotional connections with your customers through humor. Just grab the pins you like and "repin" to your own board. That's what makes Pinterest so easy. You don't have to go searching around for new images if you don't want to! Visit this page and you can see the popular images. Just click "share" and send to your own page and followers and watch the "likes" start pouring in. If you know anyone with a dog business, email this page to them and explain why it is important to get on board the social sharing phenomenon. We will be happy to answer any questions or help you get started. Just click the little icon at the top of the page that looks like an envelope! Quotes about dogs printed on reusable shopping bags will surely get the attention of other shoppers and are an innovative way to promote your business. You can put them on T-shirts, hats, shoes, anything you wish. Pillows with dog humor and sayings make wonderful dog lover gifts. CafePress allows you to create customized gitfs and items. Just click the image and it will take you their store to browse for ideas. If you want something different and unique, maybe handmade dog crafts, please let us know. We will be happy to put you in touch with a crafter who can bring your idea to life! We have been in touch with a crafter who can turn dog sayings and dog humor into works of art with unbreakable material and a beautiful chain for hanging. These make wonderful pet owner gifts. See K9 Quotables for more about this. Lovers of a particular dog breed love to decorate their home with crafts and photos related to that breed. They will even wear T-shirts with a photo of their beloved breed. You will never go wrong with a dog gift featuring their chosen breed: on a pillow, a coffee mug, a shopping bag, etc. in any shape or style. Please fee free to share any of the images you find on the Facebook page above, or if you like, send your own images to K9DogTreats and we will create a page just for you. Then you can upload to Pinterest or share elsewhere. Dog Quotes - for more quotes and images and information as tohow to use them to grow your dog business! Dog Jokes - find jokes that are perfect for the kids to tell each other. Everything on this page is rated G.
Have an Image or Story to Share? This sums up my alarm system perfectly! This dog treat recipe is so simple, even a dog can do it alone! This is so my dog! Christmas dog humor: Sure, you can send me a fruitcake for Christmas...as long as it's liver. When wearing a dog, always make sure he matches your shoes. Do not approach this dog if you have a ball you cherish...especially one with a squeaky! I'm not spoiled. 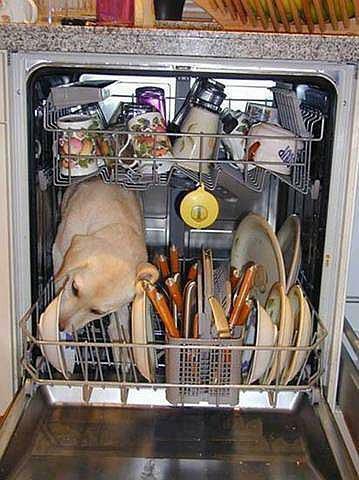 My owner is just well-trained. We could all use a psychiatrist like this one! Have you ever been asked: "What kind of dog is THAT?" Pet therapy or therapy dog? Photo courtesy Lisa from Facebook!